"This beautiful book has a fast and entertaining narrative that encourages the reader to go out to discover and wonder." Many Americas have existed and all still do in some form, if only in legend not ruins. Many of these places "were once vibrant populations with rich cultures" "where people thrived and then departed, never to return again." 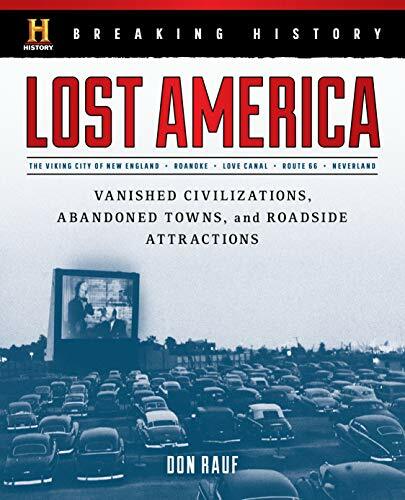 Even lost highways, abandoned amusement parks, and shuttered drive-ins "took some of the country's history with them." Don Rauf concerns himself with what remains. In a short, heavily illustrated book, the author revisits the most famous of the lost and found in America. Some of the disappearances, like Anasazi and Roanoke, "remained an unsolved mystery." The first section deals with ancient, real and mystical. Cahokia, near today's St. Louis, did exist as "North America's first great city," with more than 100 mounds and 45 ball fields. This spectacular culture built "a Native American Jerusalem." The author reverses the order of his search from the legendary to the real to explain Coronado's search for Quivira of the Seven Cities of Gold, in reality "nothing more than a village of grass houses." A later expedition did find Etzanoa, a city of 12,000 to 20,000 people but "no immense treasure trove of gold." That city disappeared, only to find rediscovery in 2017. Hoaxes and myths such as the Fountain of Youth and David Ingram's America did not leave ruins but like "the dream of an opulent Viking kingdom," Norumbega, "however, lived on." Even modern places have legends that will not die and questionable modern suppositions such as ghost stories. Many of these places have famous dark histories, spectacular ruins, or became modern news. Visiting the abandoned North Brother Island's quarantine hospital educates on an epic scale. "Even places like Roanoke are part of a bigger world story." Rauf provides thought provoking commentary. At Cahokia, its people built a wall in 1150 CE that "was the beginning of the end of a once powerful nation." In other examples, Cahawba became Alabama's first state capital in 1819 but by 1900 "all that remained were the cemeteries, ruins, and a few old buildings." "Drowned American towns" present a timely warning about climate change. Human error, however, made the people of modern Centralia, Gilman, and Love Canal "to abandon their homes. Rauf's Lost America is not lessons in loss but that "the one constant is change." We learn that through exploration of the documentary, legendary, and physically present of places like the mining ghost town of Bodie with its "church, post office, saloon, county barn, jail, general store, and barbershop" "largely unreconstructed." Similar places, exist everywhere awaiting rediscovery in an age when sadly even Colonial Williamsburg is threatened with vanishing. Every adult in our rapidly moving world knows somewhere now gone, even in urban neighborhoods. This beautiful book has a fast and entertaining narrative that encourages the reader to go out to discover and wonder. It includes sources for more information.